SOME longer standing Randpark members may recall that the last South African Open to be held at the club, in January 2000, was one of the most thrilling Opens since the tournament was first played for under the medal format in 1903. This was because no less than 11 players were in contention to win on the back nine on Sunday following a three-hour stoppage because of an electric storm. The field that year was a world class one – with Nick Price, Bernhard Langer and Ian Woosnam (all world No 1s at some stage of their careers) heading up a contingent that also included defending champion David Frost, Retief Goosen, Lee Westwood, Mark McNulty and Tony Johnstone. On that Sunday afternoon, the then 43-year-old Price – so popular throughout his career and one of those 11 players in contention – drove the fans into a frenzy by coming out after the storm delay to hole his approach for an eagle-two at Randpark’s (now Firethorn’s) par-4 11th hole. As it eventually transpired, 29-year-old Sede Mathias Gronberg took the title (Mercedes Benz were the sponsors) following a birdie at the last (then a par-5 but now of course a par-4) by hitting the green in two and two-putting for a birdie, a 67, a 14-under-par 274 aggregate, and R965 000 in prize-money. 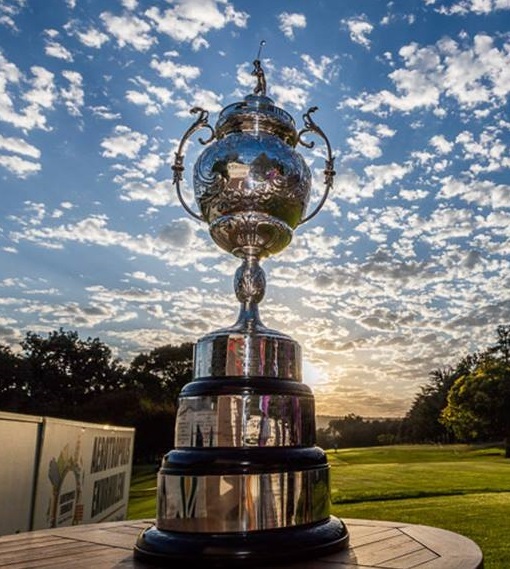 South Africa’s Darren Fichardt – then fairly new to pro golf – also birdied the closing hole by hitting a sand wedge approach from 90 metres to a couple of centimetres from the cup to finish joint second on 275 alongside Zimbabwe’s Price and Richard Gonzalez of Argentina. As is the case with next week’s SA Open at Randpark, the 2000 edition was also part of the European Tour and Fichardt’s strong finish then helped him to get full playing privileges for that tour in 2001 and, 18 years down the line, he’s still going strong in Europe. In 2000, he had been married for just two weeks to Natasha, a psychologist who helped him then and is still occasionally helping him with the mental side of the game. “I told Natasha at the time to start packing the bags as we’re about to start travelling,” Fichardt, now 43, said at the time. And, yes, they’re still travelling the world on the European Tour. As a footnote to the 2000 SA Open, Val Aiken packed her 16-year-old Thomas off to school before the tournament with his lunch pack and also a big golf bag. The sandwiches were to keep him going throughout the day and the golf equipment for his SA Open practice round. Okay, he didn’t make an impact as a young teenager that year but he too, like Fichardt, is now fulltime on the European Tour. And Thomas Aiken has a strong connection with Randpark, having been coached for many years by swing guru Martin Whitcher here at the club. Randpark, of course, hosted its first and only other South African Open in 1995 which proved to be a key event in the career of Retief Goosen, who eagled the closing hole on what is now the Firethorn course for a five-shot win on 13-under-par 275. That player tugging at his heels happened to be none other than Ernie Els, who was indeed world No1 at the time after winning both the US Open and World Match Play Championship in 1994. Goosen only three-putted once in the tournament and sealed victory with a magnificent eagle three at the 18th – then a par-5, now Firethorn’s brutal par-4 – in the final round. He rifled a one-iron down the middle, then a five-iron to a metre from the cup before rolling in the putt to win by five from Els and Mark McNulty. Goose, of course, would go on to win two US Opens and, at one stage, be ranked as high as No 2 in the world. And he will always look back at his 1995 SA Open success at Randpark as a turning point in his career, one in which he proved to himself that he belonged on the big stage. It was only his third victory as a professional, the previous two wins being on smaller ‘winter tour’ events in South Africa. Goosen won’t be back for next week’s SA Open hosted by the City of Joburg at the club but Ernie Els, playing well at 49, will be teeing up alongside fellow South African Major champions Louis Oosthuizen, Charl Schwartzel and Trevor Immelman. Branden Grace will be here, as will be the aforementioned Fichardt and Aiken.